HP together with Gilt and fashion designer Michael Bastian will launch a stainless steel case smartwatch with both iOS and Android compatibility this fall. While Samsung seems to dominate the smartwatch market, there is still room for newcomers, especially since Hewlett-Packard will bring something new to the table. HP's upcoming wearable is the result of a partnership with fashion designer Michael Bastian and Gilt, the company who will sell the device online in just a few months. As the only image available at this time shows, the HP/Gilt smartwatch is a stylish accessory with a luxury finish and a stainless steel case, as well as a round face and physical buttons. 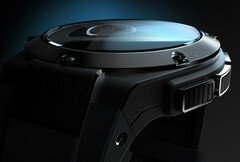 While the HP hardware under the case will offer the ability to connect with both Android and iOS devices, it seems the smartwatch will be controlled only using the buttons. The only official information available at this time concerns the availability of the device, which should be available exclusively from Gilt "this fall." We will get back to this topic as soon as we hear more about it, so stay tuned.